A little unusual in its timing if you are in the midst of winter, but here in New Zealand fresh raspberries are in abundance. However, this recipe for jam can be made equally successfully with frozen berries and the taste sensation over the shop bought jams is incredible, not to mention the wonderful aroma that will fill the house and for many will no doubt bring back memories of childhood, grandmothers, etc! You will also be surprised just how easy it is to make Raspberry Jam - no more standing there stirring and boiling the life out of it for hours on end, this can be made up in less than half an hour. So no more excuses for sickly sweet, sugary jams on your breakfast table! Even the busiest of you can take the time to make this jam and with Shrove Tuesday just around the corner, what better topping for those traditional pancakes? It can also be used as an ice cream topping, part of a dessert and put to so many other uses too . . . I bet this dish won't last very long in the pantry! Gift wrap it and give to friends . . . no need to tell them you didn't spend all day sweating over a hot stove for them. By the way, join me next week when I will be exposing a great pancake / crepe recipe . . . which will give you plenty of time to practice your tossing. I love to add some whole berries just before I pour it into the jars, it gives the jam a nice 'mouth feel' when eating. 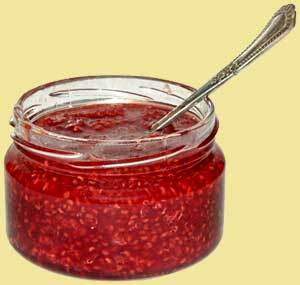 This Raspberry Jam recipe may be used for other berries also.